Maximum Sound Pressure: 93 dB SPL @ 1m. 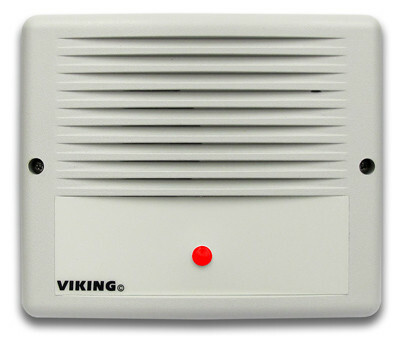 Note: For applications requiring louder ring, see Viking model PA-2A-IP. The SR-IP is a Loud IP Phone Ringer designed to provide attention getting loud electronic ringer and visual lamp for IP phone systems. When registered with a SIP server, the SR-IP will ring in one of 4 programmable ring patterns and flash a bright red LED upon ring detection. During ring detection the units internal relay contacts will also activate providing a trigger for a Viking Model SL -2 Strobe light or LPL-1 visual ring indicator. Equipped with a high efficiency Class D power amplifier and high quality loud speaker, the SR-IP is typically over 10 times louder than a telephone speaker. The advanced features of the SR-IP include programmable Automatic Gain Control (AGC) technology which automatically increases loud ring volume to compensate for background ambient noise. Great for Warehouses, Manufacturing, Shops, or other loud noisy areas using VoIp Phones. Not sure what you need? Call 800-335-0229 for help.